Dussera marks the day on which Lord Rama, a reincarnation of Lord Vishnu, liberated his wife Sita who had been abducted by Ravana, the king of Lanka. This festival, celebrated throughout India, culminates with the setting fire to an effigy of Ravana, thus signifying the end of evil. 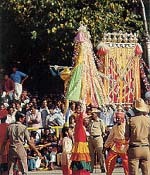 There are some great tribal events in eastern Gujarat. 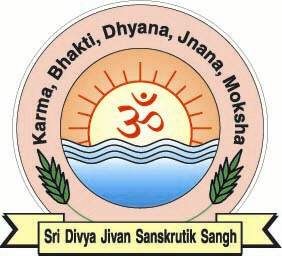 For the Sivananda Ashram, Ahmedabad, it is also of special significance because on this auspicious day, Rev. Guru Maharaj Visited us and held a memorable grand public function. This is a synopsis in English of a live lecture delivered by Pujya Sri Swami Adhyatmanandaji in Gujarati. Salutations to Sri Durga (Mother Divine) Who exists in all beings in the form of intelligence, mercy, beauty; Who is the consort of Lord Siva; who creates, sustains and destroys the universe. Dussera is the greatest Hindu festival of adoring God as Mother. Durga represents the Divine Mother. She is the energy aspect of the Lord. Without Durga, Siva has no expression and without Siva, Durga has no existence. Siva is the soul of Durga. Durga is identical with Siva. Lord Siva is only the silent witness. He is motionless, absolutely changeless. He is not affected by the cosmic play. Durga does everything. Mother-worship is the worship of God as the Divine Mother-Sri Mata. Sakti is the power of the Lord or the cosmic energy. The Divine Mother in Her aspect of Durga is represented as having ten different weapons in her hands. She is sitting on a lion. She keeps up the Lila of the Lord through the three Gunas-Sattva, Rajas and Tamas. Vidya, Santi, lust, anger, greed, egoism and pride are all Her forms. The Upasana or worship of Devi or Universal Mother leads to the attainment of knowledge of the Self. The story of the Kena Upanishad known as the "Yaksha Prasna" supports this view. Uma taught the Truth to the Devas. Goddess Sakti sheds wisdom on Her devotees. A child is more familiar with the mother than with the father, because she is very kind, loving, tender, affectionate and looks after the wants of the child. In the spiritual field also the aspirant or the devotee-the spiritual child-has intimate relationship with the Mother Durga than with the Father Siva. It behoves, therefore, that the aspirant should approach the Mother first and She will introduce Her spiritual child to the Father for his illumination or Self-realisation. Mother's grace is boundless. Her mercy is illimitable. Her knowledge is infinite. Her power is immeasurable. Her glory is ineffable. Her splendour is indescribable. She gives you Bhukti or material prosperity and Mukti (liberation) also. Approach Her with an open heart. Lay bare your heart to Her with frankness and humility. Be as simple as a child. Kill ruthlessly egoism, cunningness, selfishness and crookedness. Make total, unreserved, ungrudging surrender to Her. Sing Her praise. Repeat Her name. Worship Her with faith and unflinching devotion. Do special Puja on Navaratri days. Navaratri or Dussera is the most suitable occasion for doing intense Sadhana. These nine days are very sacred to Devi. Plunge yourself in Her worship. Do Anushthana. Devi fought with Bhandasura and his forces for nine days and nine nights. The war ended in the evening of the tenth day known as Vijaya Dasami day or the day of victory. Aspirants are initiated on this day. Akshara Abhyasa for children is done on Vijaya Dasami day. The beginning of learning of any science is done on this most auspicious day. It was on this day that Arjuna worshipped the Devi before starting the fight against the Kauravas on the field of Kurukshetra. May Durga give the milk of divine wisdom to Her children and lift them to the magnificent heights of divine splendour and glory, the imperishable state of Kaivalya and eternal Sunshine!